Almost every visit to the doctor these days includes getting one or more lab tests to help the doctor diagnose and manage our ailments. These tests provide valuable information about our health, but often times they are only a snapshot of our current state. Sometimes the trends are even more important than one measurement. However, keeping track of those trends on your own can be difficult. If the doctor gives you your results, how do you keep track of them? Are they in an electronic form (such as in a hospital portal), or simply on paper? More importantly, if you have conditions such as congestive heart failure and kidney failure, and need to see multiple doctors, do they need to do the same tests multiple times simply because the 2 doctors never seem to have time to talk to one another? 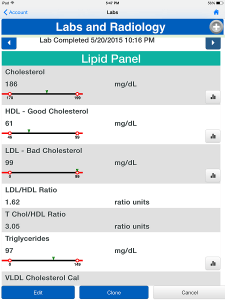 Introducing the new feature on ZibdyHealth – Labs and Radiology. In the Labs and Radiology section of your account, you can store your lab results – timestamped – forever. You can load the results by either typing in the results of the tests from the doctor’s printed results sheet – or (much more easily) by uploading them electronically (if your provider can make them available as BlueButton+ compliant documents). Zibdyhealth can read these and allows you add them to your ZibdyHealth account easily. Once you have the Lab test results from one doctor or clinic recorded in your account, you can let other doctors/clinics see them either by emailing a pdf report of them, or upload them into the new physician’s electronic record system via a BlueButton+ compliant CCD (Continuation of Care Document). This will prevent needless and expensive tests from being repeated. One of the most exciting aspects of ZibdyHealth’s Lab Tests is that you can track them over time. 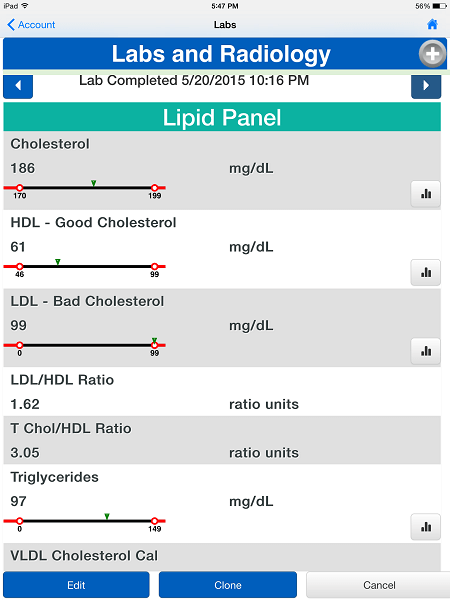 ZibdyHealth has a special charting feature that allows to trend your results– such as cholesterol– when measured over time in multiple tests. Many test results – including Blood Pressure, Heart Rate, Pulmonary (lung) Capacity, Na+, K+ and uric acid levels can similarly be traced, to see how your numbers are changing over time. This information is priceless to your doctor too, to maintain your health. Most panels are built around billing purpose of chemistry or biology used to run these tests. Lab panels on ZibdyHealth work little bit differently. We have taken time to consult with numerous experts in pathology and physicians to aggregate lab tests in panels which make sense to you and your doctor. We bring all tests which are required or useful in certain conditions in one group. This way it will be easy to view and track them. If you do not have results for all the tests we have aggregated in a single panel, you may just delete that lab test by clicking on “-“ sign in front of test name. 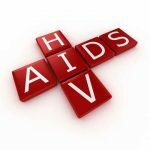 For Example: our HIV panel has chemistries, liver function tests, and blood counts, in addition to viral loads and CD4+ T cell counts. This helps you and your physician more efficiently track your health. 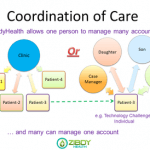 As we have described before, a core feature of ZibdyHealth is the ability of multiple care givers to manage the health of a patient. Having access to daily objective data can help family members remotely monitor the conditions of parents and loved ones. For example, diabetic patients can record their daily blood sugars into their ZibdyHealth account. If a relative remotely notes that the blood sugars are increasing, it may be a sign of an infection or other problem, and they can relay their concerns directly to the patient or another family member in closer proximity. This can also allow school nurses to coordinate the care of students with chronic conditions. Having up to date information on the child’s medication regimens, as well as parents observations, can allow school nurses to better manage asthma exacerbations when they arise. This sharing of detailed lab information can make your next telemedicine call or a visit to a new physician for a second opinion efficient and effective. Importantly, our secure sharing feature also allows users to stop sharing just as quickly, keeping your health information safe. ZibdyHealth makes storing and accessing your Lab Test results simple and reliable. Just another way that ZibdyHealth helps you take control of your health.